Of all Birthday Party Animals, the wonderful Jax is truly a gentle giant among parrots at 3+ lbs and over 34″. 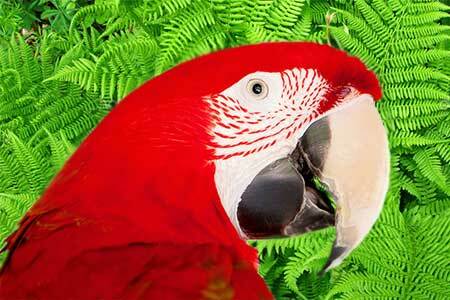 She is a Greenwing Macaw who dazzles everyone with her big personality and her beautiful red, blue, and green feathers. in Raleigh in 2001. 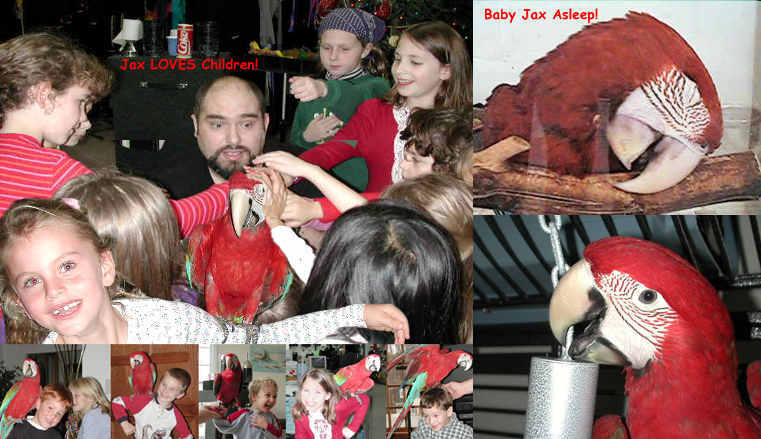 In captivity, this type of parrot lives for 70-100 years, so Jax is much more than a lifetime commitment! over other types of parrots because they are friendly and love attention, but mostly because he fell in love with wonderful Jax! Jax is a true show bird. She loves the limelight and has learned some tricks to get even more attention. Some of these tricks are incorporated into Captain Kid’s show. and can learn to use very basic words, and not just repeat them. Their intelligence is compared to a four-year-old. They can also do many other things, like ride a bike, skate, and dunk a small basketball. Another parrot type, the African Grey, can actually learn to converse with people, just like some gorillas and other species. It takes a lot of work from the trainer, literally years, but it has been done. with no toys and fed seeds or a cheap parrot diet that lacks nutrition. Jax has the largest cage available, and an unending supply of toys, and eats the best food possible, much right from birthday magician Captain Kid’s dinner plate. 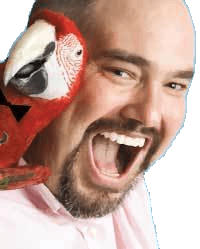 Captain Kid performs his Children’s Magic shows in Raleigh NC, Durham NC, Cary NC, Wake Forest NC, Clayton NC, Garner NC, Chapel Hill, and Fayetteville NC and will travel to other locations!